An anonymous commenter on this site's Tumblr asked, "How would you fix Epcot's future world? Curious. I like your brainstorming." For the most part, the PI Tumblr is a sort of research blog, full of scraps that might maybe someday be developed enough to merit posting here, but I guess I've thought so much about this prompt that it hit the ground running. 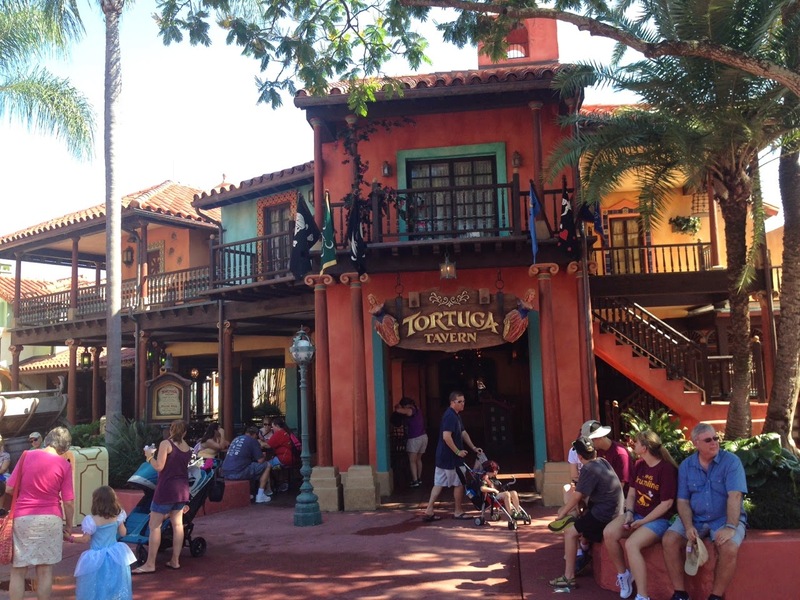 Here's a Forensic Story from the queue of Florida's Pirates of the Caribbean. Actually, better make that "Forensic Stories," plural. Each layer of this sightline has one to offer. 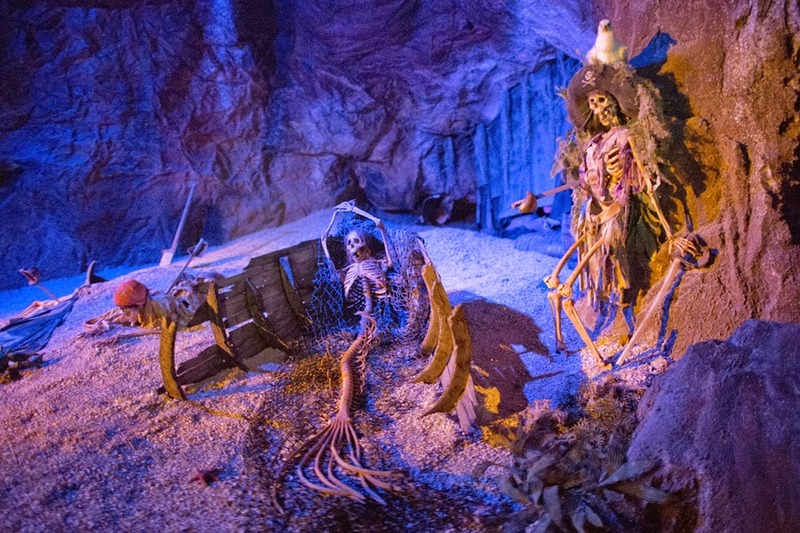 In 2006, Disney inserted Jack Sparrow and a few other characters from the Pirates of the Caribbean films into the rides that they were adapted from. This overlay proved controversial. Even the professionals who are responsible for the films found it unsatisfying. Here's a quote from screenwriter Terry Rossio's account of riding it for the first time. "We...enter Adventureland. 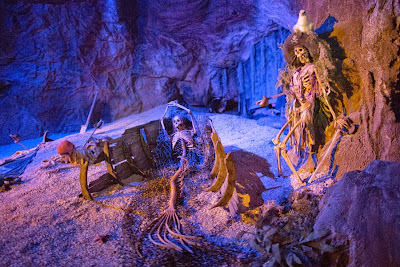 I can't wait to go onto the newly refurbished Pirates of the Caribbean ride. Back in the Bahamas, Johnny [Depp] had called us into his trailer to discuss the proposed changes he'd been sent. We agreed that the Jack Sparrow vignettes felt uninspired, and made suggestions on how they could be improved. The original Marc Davis sketches were all about the suspended moment, a particular situation that indicated a larger story (think of the dog with the keys). So we were really curious to go on the ride and check out the results. "So we hop onto our boat, and some of it is impressive... But the vignette poses were still bland; to end the whole affair with Jack Sparrow sitting on a bunch of treasure, that's about as straightforward as you can get ([my writing partner, Ted Elliott] and I call it 'first draft theater.') 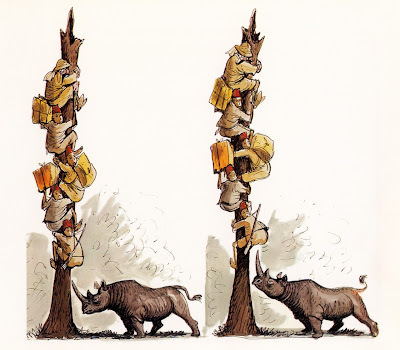 It's not that captured moment style that Marc Davis did so well. Later we heard that the imagineers wanted to do something more creative, but ran into budget restrictions." Remember, this man voluntarily put his name on a film franchise full of scenes like this one. Ouch. It's telling that none of the critical theory written about the ride after 2006 even acknowledges the overlay. For example, Foxx's Fire in the Night, which is one of theme park academia's most celebrated essays, was written five years after the fact, but you wouldn't know by reading it. Fortunately, it almost doesn't matter how many characters get slathered over the scenes. The overlay misunderstands the original ride, the film franchise, and theme park narratology so deeply that the brilliance of what used to be in its place tends to shine through. Where it doesn't, the overlay feels more like graffiti than a bastardization. Skeptics are left feeling that, "One day someone will have the decency to fix this." Personally, it took eight years of riding and four months of working at the attraction to understand the overlay's story, but I think I did it. Here's one of my favorite Forensic Stories. It can be found as we exit the Jungle Cruise. The joke is obvious: a dangerous animal, who’s strong enough to pry open the bars of its cage, is running loose. To me, what makes this story so special is the rope between the bars. Why is it there? Here are some clues I’ve noticed. The rope fits the bent bars, which implies it was tied on after the escape. 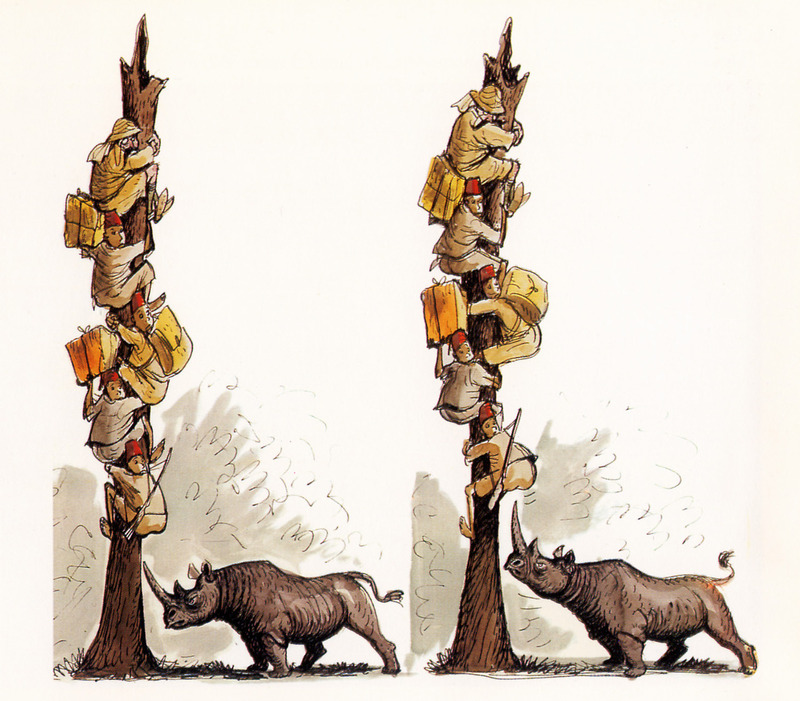 The rope is also…well…rope, which is even more pliable than the bars that the orangutan was strong enough to bend. If the skippers intend to keep using this as an orangutan cage, then rope isn't the best solution. Perhaps they can’t afford a new cage, so they figured, hey, this is better than nothing. That said, there’s an explanation I like even better: the skippers tied it on out of spite. After all, the Jungle Cruise—and Adventureland, in general—explores the absurdity of humankind’s attempts to dominate nature. So imagine the skippers being so hurt that a wild orangutan didn’t wanna suffer the oppressions of domestication that, after it escapes, they rope up its cage. "Fine! Leave! I just hope you enjoy your natural habitat, because you’re not welcome in our small cage any more! Boy, did you blow it, mister!" The Haunted Mansion: an attraction so evocative that guests have been deducing its fictional history since it opened in 1969.
Who owns the house? Is it the Ghost Host, or Master Gracey, or--hey, are they the same person? Does the Bride push us off of the balcony, or is it a coincidence that we enter the graveyard on our backs? 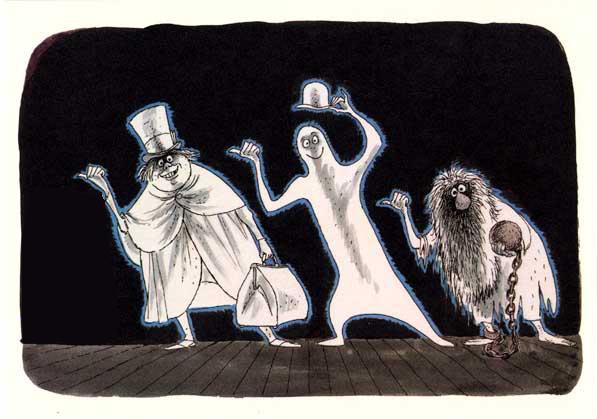 Why are the maids and butlers loitering in the Stretching Room when there's a mansion's worth of cobwebs that need dusting? It’s a ride full of open-ended questions, and its fandom has been trying to answer them for decades. Most of the resultant fanfic is convoluted, much of it is harmless, and some of it has even been canonized. On the other side of the fence, a poorly phrased quote from Imagineer Marc Davis has incited a backlash. It is now fashionable to claim that the ride doesn’t tell a story, at all. This belief is nonsense, but it's a dangerous breed of nonsense: the kind that prevents progress. If we hope to see more attractions like the Mansion, it's crucial to understand what its story is, why it’s easy to miss, and why the ride is still fun if we miss it. Here's a Forensic Story that I absolutely adore. Here's an ineffective GIF Story from the Little Mermaid dark ride. Ariel wants Eric to kiss her, but he won't do it because...of...reasons. I mean, c'mon, just look at Eric’s face! You could get thrown out of a brothel with an expression like that! He’s ready to kiss her, and nothing's stopping him, so why won't he do it? The only explanation I can find is, "Because then the ride would end too soon." This GIF Story is even less effective in person. Every so often, Eric and Ariel lean forward to kiss, then decide not to, then try it again, and so on. Maybe Ariel has halitosis, and Eric has short-term amnesia...? Snark aside, this GIF Story has a lot going for it. Boiling an iconic scene from a movie down to a single, seamless, repeatable action is impressive. Yet without a reason to repeat this action, it simply fails to satisfy. ...except here in the ride, he's perched right by Eric's ear. Then, whenever Eric and Ariel lean in to kiss, Scuttle squawks and kills the mood, forcing the lovers to begin the cycle anew. This is just one of the ways that an understanding of theme park narratology can elevate a well-constructed scene, like the "Kiss the Girl" room, into a satisfying experience. Time to be turnin' around...if only you could! 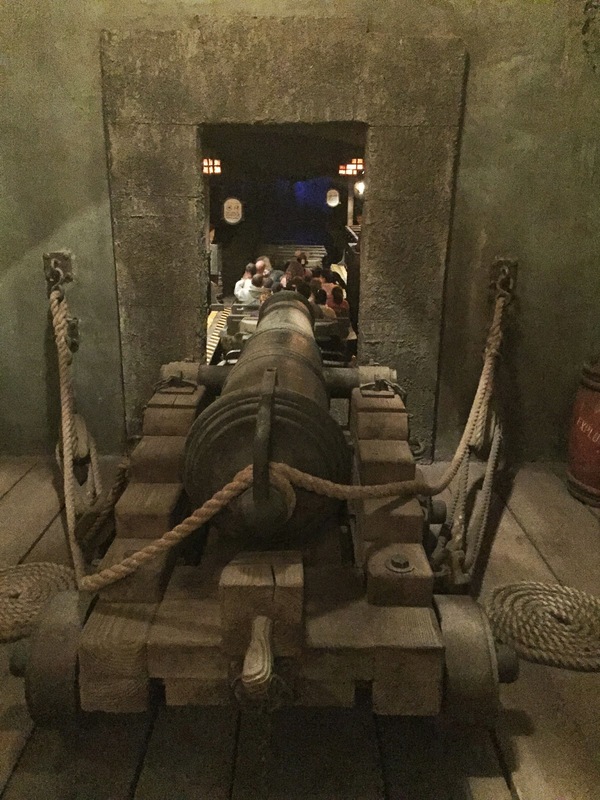 Theme parks often tell us two stories at once: an Observable Story (which uses a third-person perspective) and an Experiential Story (which uses a second-person perspective). Few attractions flaunt this structure as clearly as Splash Mountain does. While its two stories are obvious enough by themselves, the ride connects them in a way that builds an unsettling degree of tension. 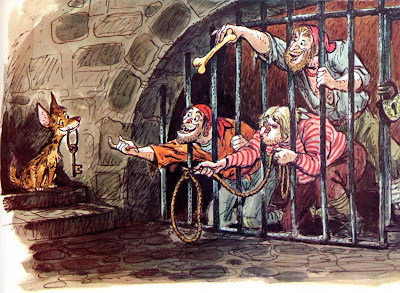 Marc Davis was one of the most influential Imagineers of all time. Chances are, if you like Disney’s parks, he had something to do with it. He’s certainly one of my heroes, and--like any worthwhile hero--when he says something I disagree with, it forces me to evaluate my beliefs. Well, it took three years of research, but I can now say honestly that, in the following quote, Marc Davis pisses me off. Apparently this was a jab at former CEO Michael Eisner, who filled the parks with narrative structures that were designed for films, but not parks. In that context, I agree with Davis' gist. What pisses me off is his phrasing. Eisner may have used the word “story” as a slogan to rationalize some tasteless choices, but he didn’t change its definition. Theme parks are full of stories! It's part of what makes 'em so special. The difference between an amusement park and a theme park is that a theme park is unified by...well...a theme--which is a narrative concept. What’s more, there are tons of narrative structures that were designed exclusively for the parks. They don't exist anywhere else. If we wanted to tell a Forensic Story, for example, we couldn't do it in a movie or a novel. It would be too oblique. We'd have to tell it in real life, by committing a crime and then toying with the police. How clever! If only Zodiac had used his skills for Imagineering! Theme parks and narratives have been revolutionizing one another for the better part of a century, and the results have been fascinating. Despite that, their relationship is barely being studied. Davis certainly isn't encouraging anyone to do so with that quote. To me, that's a shame--but maybe I’m being too harsh. After all, the quote gets one thing right. Most attractions don’t have a story. To all who come to his happy place: kidnap and ravage and don't give a hoot! Wanna hear a story from the Happiest Place on Earth? A man conquers Death, itself, and returns to life! Unfortunately, when he wakes up, he finds himself in a coffin that's been nailed shut. Unless he can muster enough strength to pry off the lid, he’ll be buried alive as quickly as grief will allow. Passport to Dreams Old and New.